Below is a list of add-ons (extensions) for RosarioSIS. Download them to add extra functionality and customize RosarioSIS to your needs. Modules add new programs to RosarioSIS. Plugins add new functionalities to existing programs. Themes let you easily customize the look and feel of RosarioSIS. Import Students from a CSV or Excel file. 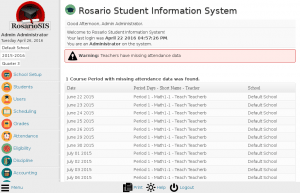 Easily bulk upload your Students database to RosarioSIS. 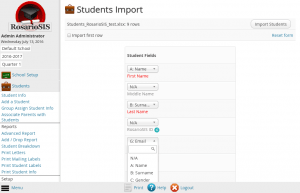 Import Students info (general & custom fields), enroll them & eventually create accounts. Import Addresses & Contacts (Father, Mother, Guardian…) + advanced features. Import Users from a CSV or Excel file. 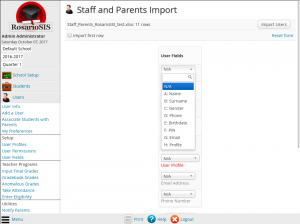 Easily bulk upload your Teachers, Staff and Parents database to RosarioSIS. Import Users info (general & custom fields) & eventually create accounts. 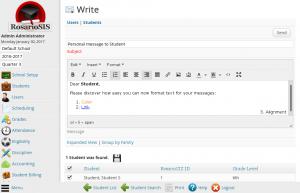 Internal messaging system for communication between administrators, teachers, parents and students. 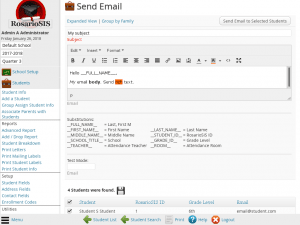 Send email to students and users from within RosarioSIS. 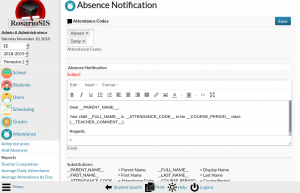 Send Report Cards, Discipline Logs, Student Balances and Absence notifications to parents. 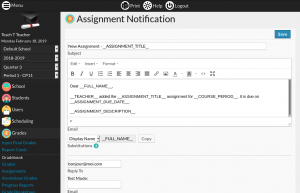 Send Report Cards, Discipline Logs, Student Balances and Assignment notifications to students. 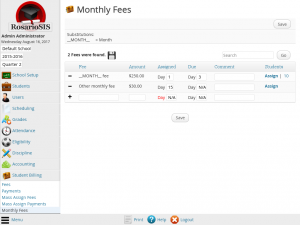 Automatically add Monthly Fees and easily print Receipts. Teachers can assign Quizzes for their students to take, online. 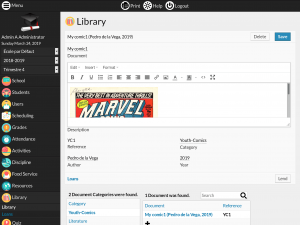 Manage your school library documents (book, magazine, CD, etc.) and lend them. 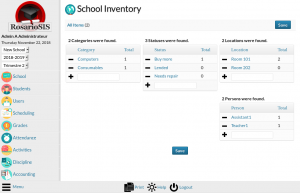 Manage and keep track of your school asset. 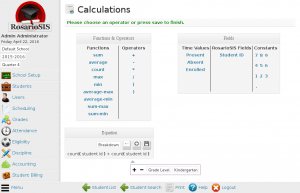 Generate (State) Reports for your School: perform calculations using your students and their data as variables; get student breakdowns. Define and add a custom, rich text header and / or footer to PDF documents generated by RosarioSIS. Send emails using SMTP. Having problems with RosarioSIS not sending emails? Use this SMTP plugin to fix your email deliverability issues.